We’re a family that loves fries but I don’t often feed my son fries in restaurants because they are usually deep fried and unhealthy. 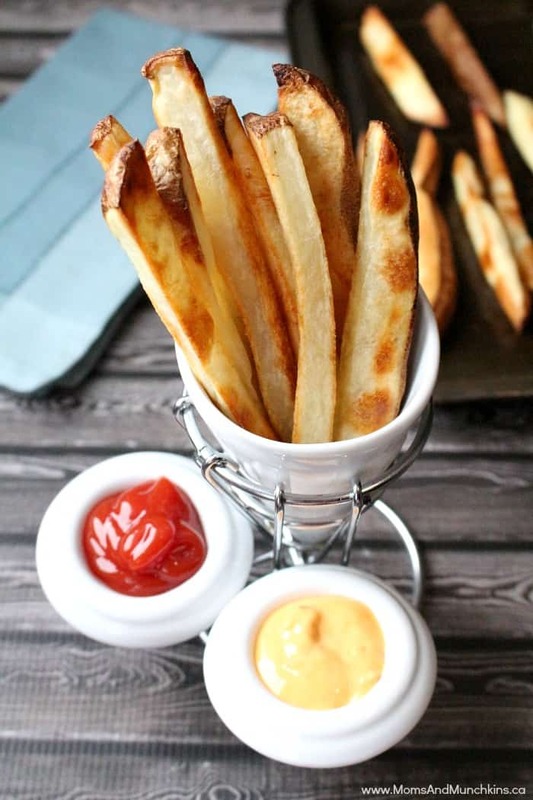 We came up with a healthy way to make our own homemade fries and they are delicious! You can adjust this recipe for any portion size but I’d say that fresh out of the oven are the best so don’t plan on making a bunch of leftovers to eat tomorrow. Also, I didn’t put a quantity on the sea salt in the recipe because you can salt them to your taste preference. You can use any type of potatoes for these but I find that the Idaho potatoes turn out the most delicious as fries. Slice potatoes lengthwise into fries. The thicker they are, the longer they'll take to cook. Place sliced potatoes in a large bowl and cover them with cold water. Let them soak in water for 15 minutes. Drain potatoes and blot with a paper towel to remove excess moisture. Place potatoes on the cookie sheet in a single layer. Lightly spray the top of the fries with cooking spray. Bake in oven for 15 minutes then turnover fries and bake for an additional 15 minutes. The cooking time could be shorter or longer depending on how thick you cut the fries. You could substitute the potatoes for sweet potatoes as well. A spicy salad dressing is an excellent dipping sauce for sweet potato fries. You can find more recipes on our Recipe page like appetizers, delicious desserts, potluck dishes and more.